In the community where I live, there is one covered bridge, the Patrick Owens Bridge, otherwise known as Rusagonis River #2. At one time there were at least four covered bridges across the Rusagonis Stream. 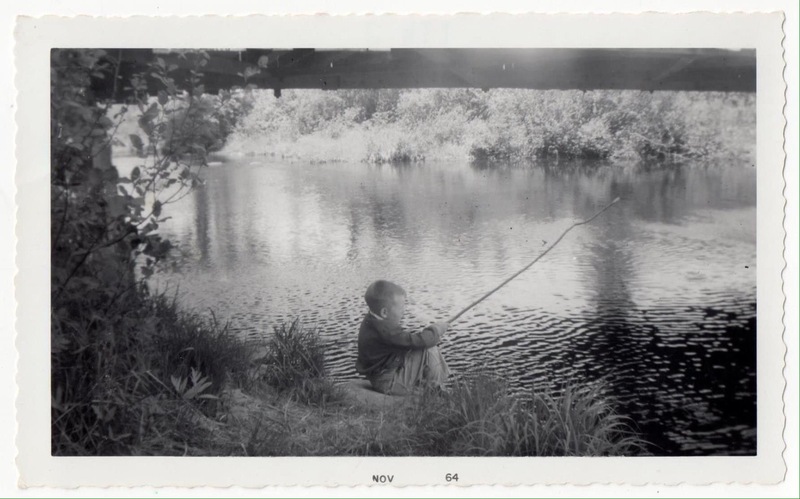 The photo below was taken in 1964 and shows my husband as a boy, fishing under the covered bridge on the North Branch of the Rusagonis Stream. In the photo, he is fishing with a home-made pole. That bridge was gone by 1978 when I first moved to New Brunswick. I have always loved covered bridges and I am pleased to announce that my new poetry book “in the shelter of the covered bridge” will be out later in 2017, published by Chapel Street Editions, Woodstock. The book is a compilation of my poetry about plants and animals living in the vicinity of some of the covered bridges in New Brunswick. The work was funded by artsnb and includes some of the poems that won the Alfred G Bailey Prize in the Writers’ Federation of New Brunswick Writing Competition in 2016. “in the shelter of the covered bridge” will include poems about many of the covered bridges in the St. John River valley and is illustrated with my own pencil drawings. I’ll let you know as soon as it is available! Covered bridges are an all-time favourite in this household. Not sure which I like best, the evocative picture of your husband or your sketch. Looking forward to the release of your book.